3rd Place — Eric Grajales (Michigan) dec. David Habat (Edinboro), 4-2 — The Wolverine and first-time All-American ended his career by scoring a first-period takedown then holding off a late shot attempt by the Fighting Scot who got on the board with a takedown 1:22 left in the match. 5th Place — Drake Houdashelt (Missouri) dec. Mitchell Minotti (Lehigh), 3-0 — The Tiger scored the match’s only takedown with eight seconds left in the second period. 7th Place — James English (Penn St.) dec. Kendric Maple (Oklahoma) 2-1 tb — After the Nittany Lion escaped 12 seconds in the first tiebreaker phase, he rode out the 2013 champion at 141 pounds for the win. No. 5 Jason Tsirtsis (Northwestern) dec. No. 1 Drake Houdashelt (Missouri), 2-1 tb — Tsirtsis got out from underneath the Tiger with one second left in the second half of the first set of tiebreakers to give Northwestern and coach Drew Pariano a finalist for the second straight year. No. 11 Josh Kindig (Oklahoma State) dec. No. 15 Mitch Minotti (Lehigh), 4-2 — Down 1-0, Oklahoma State’s Josh Kindig used a second-period takedown and third-period reversal. Kindig held off a hard-charging Minotti in the closing seconds to become the first of four straight finalists for the Cowboys. No. 1 Drake Houdashelt (Missouri) dec. No. 9 Eric Grajales (Michigan), 3-1 — The Tiger scored the match’s only takedown with one second left in the first period, then held on to beat the Wolverine, who rode out Houdashelt the entire second period. No. 5 Jason Tsirtsis (Northwestern) dec. No. 4 Kendric Maple (Oklahoma), 2-1 tb — The Wildcat freshman upset the returning national champ at 141 pounds by riding out Maple the entire 30 seconds of the his tiebreaker advantage. Earlier, Tsirtsis escaped with 21 seconds left in the first 30-second tiebreaker. No. 11 Josh Kindig (Oklahoma State) dec. No. 14 Scott Sakaguchi (Oregon State), 7-5 — Kindig scored a takedown in both the first and second periods and built up nearly two minutes of riding time before the Beaver rallied to tie the score 5-5 on a takedown with 52 seconds left. With the Cowboy clinching the riding time point, Sakaguchi released Kindig but could not score anymore. No. 15 Mitch Minotti (Lehigh) decd. No. 10 Zach Neibert (Virginia Tech), 4-3 — A 1:15 riding time advantage gave the MountainHawk the deciding point after the Hokie tied the bout on a takedown in the closing seconds. Minotti built his riding time after scoring a takedown with 1:25 left in the first. • Despite his No. 14 seed, Oregon State’s Scott Sakaguchi pinned No. 3 seed Chris Villalonga in 4:43. • Oklahoma State’s Josh Kindig upset No. 6 Jake Sueflohn (Nebraska), 7-5. • Minnesota’s All-American Nick Dardanes — seeded second — became the highest seed to lose a first round match when The Citadel’s unseeded Matt Frisch upset the Gopher, 8-5. Frisch’s record before the NCAAs was 27-9. • Michigan’s Eric Grajales earned the only fall at this weight when the Wolverine — who gave up a first period takedown to trail 2-0 — pinned Kent State’s Mike Delpalma in 3:32. • Oklahoma’s Kendric Maple — the 2013 champ at 141 pounds and seeded No. 4, secured a 3-1 victory over Ohio U’s Tywan Claxton by scoring a takedown in the third period. • Penn State’s James English, who did not become a starter for Penn State until just before the Big Ten tournament, opened with a 5-4 tiebreaker upset win over No. 12 Dylan Cottrell of Appalachian State. • Oregon State’s Scott Sakaguchi, a 2013 All-American who is seeded No. 14, scored the match’s only takedown in overtime to beat Wisconsin’s Ryan Lubeck, 3-1. Missouri’s Drake Houdashelt earned a No. 1 ranking after winning the Southern Scuffle, Jan. 2, in Chattanooga. There is only one former national champion at this weight class — Oklahoma’s Kendric Maple — but the Sooner is seeded fourth in this year’s tournament at 149 pounds. One reason is that Maple — who won the 141-pound championship in 2013 after also claiming fourth in 2012 — has lost four matches this season. Another reason is that Missouri’s Drake Houdashelt, who finished sixth at 149 last March, has been ranked No. 1 since winning the Southern Scuffle by pinning Minnesota’s All-American Nick Dardanes in the final. Emerging as the Big Ten’s best was Northwestern freshman Jason Tsirtsis, who avenged an earlier-season loss to Dardanes, then defeated Nebraska’s Jake Sueflohn in the Big Ten final. 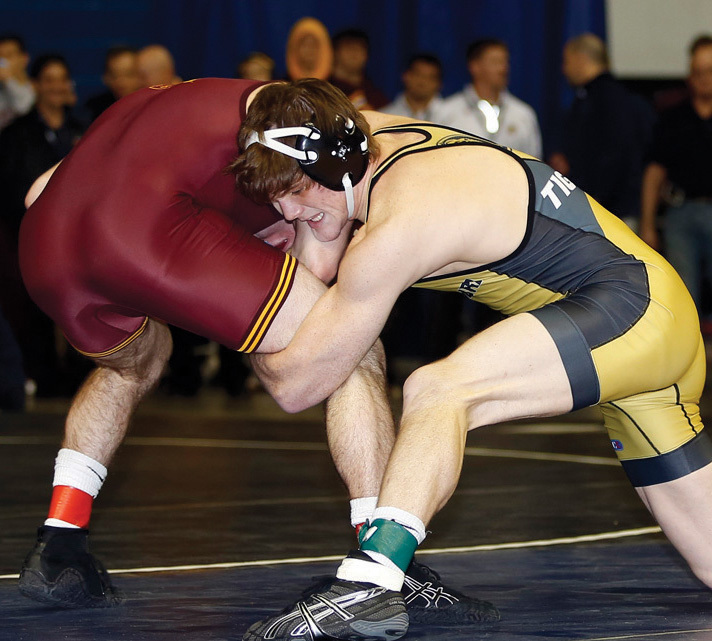 Sueflohn, who lost in the Round of 12 in last year’s NCAAs, had won 15 straight matches before losing to Tsirtsis. Cornell senior Chris Villalonga, who has failed to win a match in two previous NCAAs, is finally enjoying the fruits of his labor, especially after defeating Maple at the National Duals and by winning the EIWAs. There are two other highly-rated wrestlers at 149 pounds who are also looking for their first All-American honor: Oklahoma State’s Josh Kindig, who defeated Maple earlier in the year; and Michigan’s Eric Grajales, who has competed in three national tournaments and twice lost in the Round of 12. Both Scott Sakaguchi (fifth at 149 last year) of Oregon State and Zach Neibert (eighth at 141 in 2013) of Virginia Tech have earned All-American honors, but struggled during the regular season. Fortunately, they righted the ship by winning Pac-12 and ACC championships, respectively.